It sounds like a contradiction in terms but savoury sweetpotatoes are really great.Don’t get me wrong, I just love sweetpotatoes drenched in butter and sugar and cooked with cinnamon sticks until it is sticky and translucent, but the savoury version is a nice change. I served these with lemon chicken and a green salad. Wash the sweetpotatoes and pat dry, bake in the oven drizzled with the olive oil and salt to taste at 180 C until soft and crispy on the outside. Set aside to cool. Fry the garlick, onion and peppers in butter. Halve the sweetpotatoes and scoop out the insides which is then mixed with the fried garlic mix. Mix in the egg and add the nutmeg. 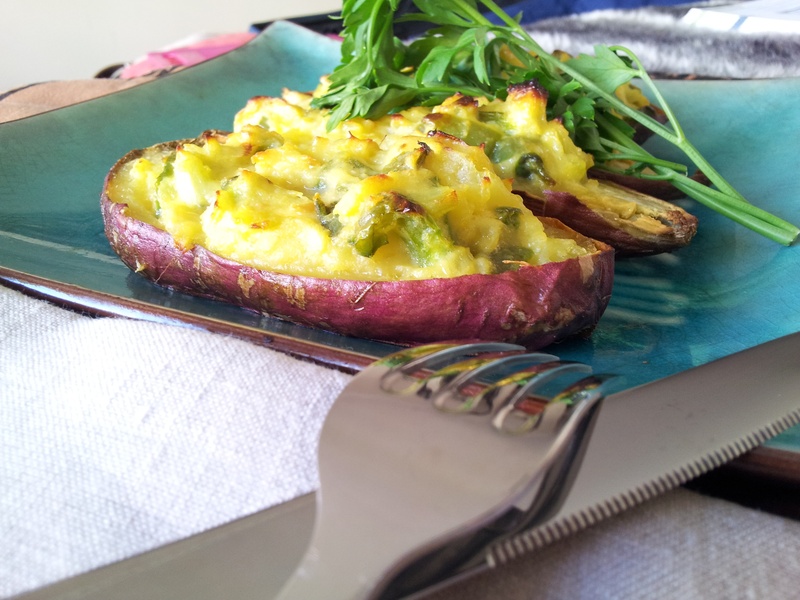 Spoon the mixture into the empty skins and bake for 20 minutes at 180 C. Grill the last 5 minutes. The egg turns the dish into a beautiful bright yellow. 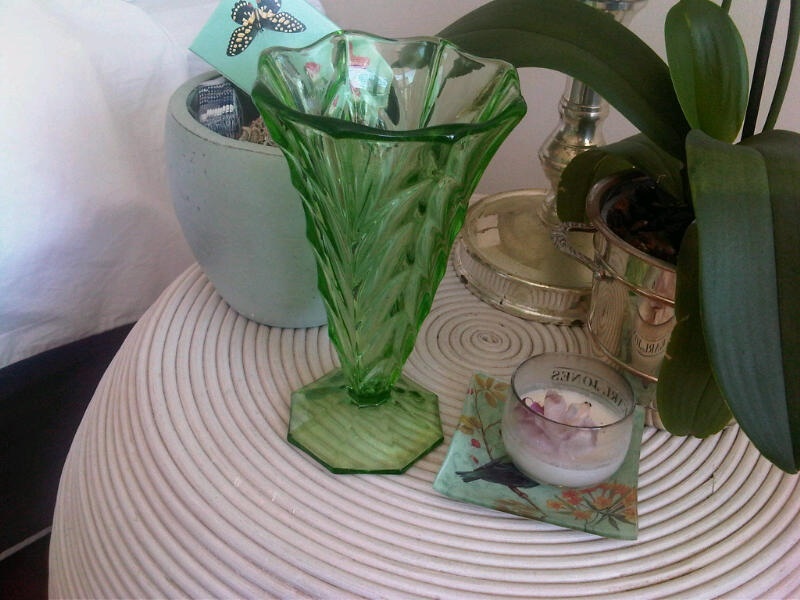 My friend Ina gave me these gorgeous vintage green classes she found at the Milnerton market as a birthday gift and it doesn’t matter what I serve in them, they normally steal the show. 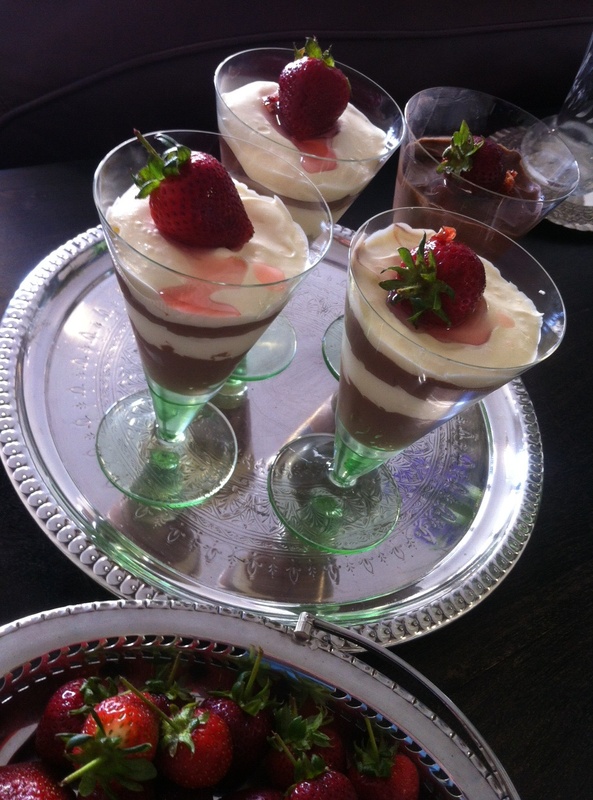 I gave dark and white chocolate mousse a try for a dinner party, which worked well as it can be prepared and tarted up well in advance and kept in the fridge. I prepared mine the night before and it gave me time to clean up the unholy mess I can create in a kitchen, or as my daughter says, I am my own personal hurricane in a kitchen……. I found this recipe on recipe.com and used white chocolate and 1x teaspoon of vanilla extract for the white mousse. The consistency of the white mousse is different from the dark version but with the layering in the glasses it does not matter. I am personally not a fan of any white chocolate as it just does not taste like chocolate to me, so I filled my glass with the dark variety only- cooks privilege! Put the chopped chocolate in a medium heatproof bowl and set the bowl in a pot of barely simmering water. Stir the chocolate with a heatproof spatula just until it is melted. Remove the bowl from the pot, add the butter to the chocolate, and stir until the butter is completely melted and the mixture is smooth. In a medium bowl with an electric hand mixer on medium-high speed (or with a balloon whisk), whip the egg whites and salt until they barely hold soft peaks. While whipping, gradually sprinkle in the sugar-go slowly, as adding it too fast may cause the whites to fall. Continue whipping until the whites just start to hold stiff peaks. Don’t over beat or the dissolved sugar may weep out of the whites. Whip the cream in a large bowl until it’s fairly thick and holds a soft peak when the beaters are lifted. With a large spatula, gently fold about one third of the egg whites into the chocolate until the mixture is no longer streaky. Fold in the remaining whites. Scrape the chocolate mixture into the whipped cream. Fold gently until the mixture is uniform in colour and texture. Divide among 4 dessert dishes and serve immediately, or refrigerate for at least 30 minutes for a slightly firmer texture. Garnish. Hierdie resep vra om in Afrikaans geskryf te word. My suster Heleen(sy is die bakster in die gesin) het nou die dag weer my ma se ou konfyttertjie resep nader geruk en vir my gestuur en nou bak ons weer almal konfytertjies-en eet dit natuurlik ook tot dit op is. Enige konfyt is lekker maar ek verkies appelkooskonfyt. 1. Room botter en suiker. 2. Voeg goedgeklitste eier en vanilla by. Vou bruismeel en sout in eiermengsel en knie tot sagte deeg. 3. Druk twee derdes van die deeg in oondpan, smeer appelkooskonfyt bo oor en rasper res van die deeg oor. 4. Bak 20 minute by 180grade tot ligbruin. Sny in blokkies. Food and ideas of what to cook sometimes( a lot) begins for me with the container or the prop or the pretty things I see and which then starts an obsession to fill that container/ prop/prettiness with the right food. 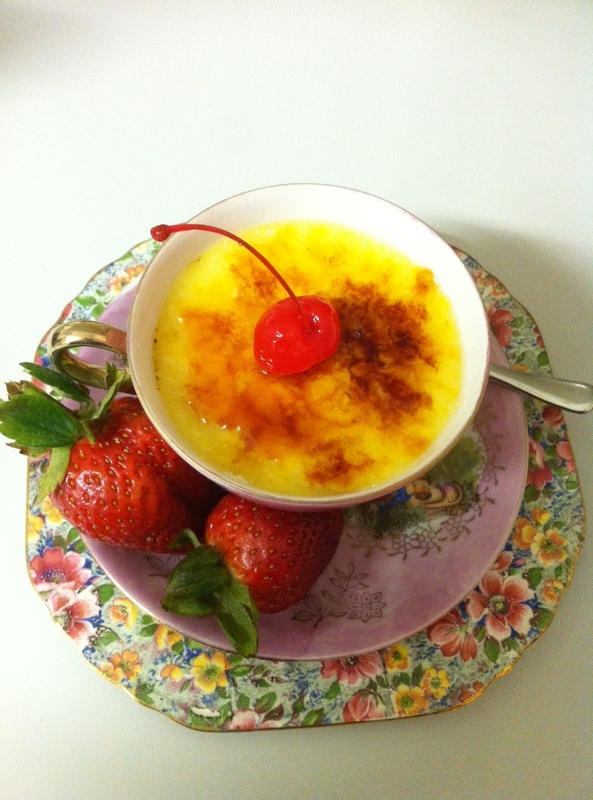 Colours do the same thing as I think in colour.The vintage porcelain cup and saucer here just had to have creme brulee in it and obviously I had to find a recipe which did not call for baking the dessert in a bain-marie as I did not want to damage the cup. I found a recipe in a photocopied type recipe book I bought a long time ago from someone selling it for fundraising (so therefore origin unknown) and I slightly changed it to suit my needs. 1. In a medium heavy-bottomed pan, heat cream with vanilla beans until bubbles begin to form at edges. Remove from heat and let stand 30 minutes. 2. Beat egg yolks with sugar until pale and thick. Remove vanilla beans from cream and pour into egg yolk mixture. Cook, without boiling, over low heat until mixture thickens and coats the back of a metal spoon. Remove from heat and divide evenly among 6 large ramekins or custard cups. Cover and refrigerate 3 hours, until set. 3. 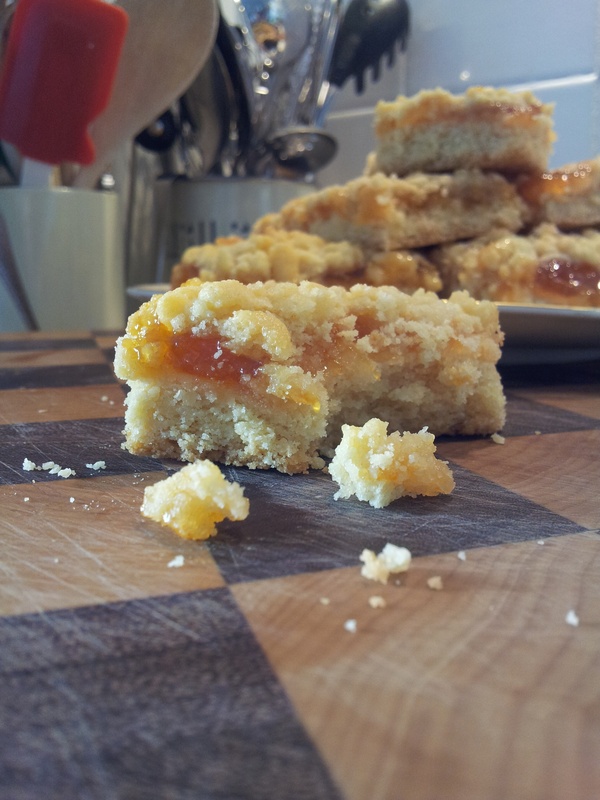 Prior to serving, sprinkle remaining sugar evenly over custards and brown with a kitchen torch or under the oven broiler. Refrigerate until serving. I topped mine with cherries and rose syrup just for the pizzaz of it! Woolworths also sells and amazing Creme Brulee mix which does not require baking and is absolutely delicious. My daughter returned home from a 9 month working stint in Chile in December. The list of cravings she had for home food started via Skype, FaceTime and eventually on a written list presented to me on her arrival. 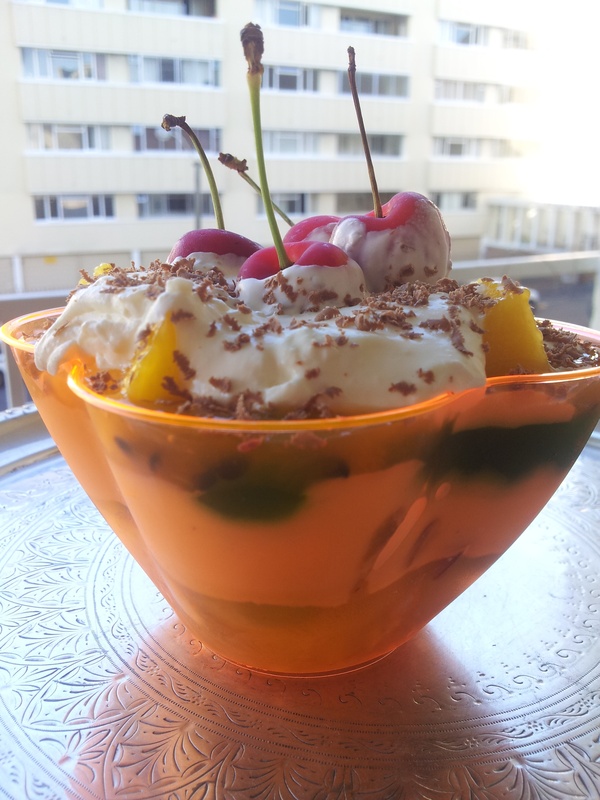 One of the cravings was for my friend Helena’s trifle and it had to be for our Christmas lunch of course. Well, the trifle ended up to be my own version of the recipe as I can not even dream of recreating the spectacular Helena version. We recently had take-away ice cream in these neon bowls and I saved them for picnics but the colour of the bowls screamed(at me at least…) for some layered trifle. Fresh fruit: grapes,pitted cherries,mango,peach and grenadilla pulp layered with jelly, sliced Madeira cake and home made custard.